The winner and runner-ups of World Mayor 2012 will be chosen based on the number of nominations in relation to the size of their cities and, more importantly, on the persuasiveness and conviction of testimonials received during this year's World Mayor Project. Below we publish a selection of comments received to date about WM nominee Park Wan-su, Mayor of Changwon City, South Korea. Mayor Park has signed up to the City Mayors Code of Ethics. Comment: A person who puts his or her own beliefs and principles into practice is the driving force for change in our society. 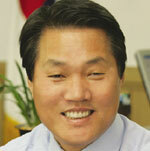 Chief Park is changing this society with his extraordinary philosophy and beliefs in administration. He believes that the most important thing for establishing a better society is to establish basic foundation. rds the environment, and this is dissolved in their daily lives. Especially 24 hours unattended bicycle rental system, 'nubija' is attracting attention recognized by the world as the next-generation green transportation. These environmental policies of Changwon were presented at Jeju UCLG World Congress in 2008, and have gained attention of the world.